From PayPal and Venmo to Square Cash to Google Wallet, peer-to-peer mobile payment apps are perfect for friends and loved ones who want to exchange relatively small amounts of cash—say, $30 for dinner, or maybe $100 or more if you're splitting a wedding gift. We've tested seven of the top mobile payment apps, using them to transfer money back and forth, split checks, and more. Some apps will let you send or request cash from anyone, while others require both parties to sign up for an account before any money changes hands. Some apps are better at splitting the bill than others, and each app has its own schedule of fees and spending limits. Just to be clear, we're focusing on apps that let friends and family exchange relatively small amounts of cash. If you want to send large amounts of money (as in more than a few thousand dollars), pay a stranger for goods or services, or transfer cash overseas, look elsewhere. Read on for our take on which mobile payment app is best for you, and what to keep in mind while you’re app hunting. Note: Missing from our roundup is Apple Pay through iOS's iMessages feature, which won't land on iOS until later this year. 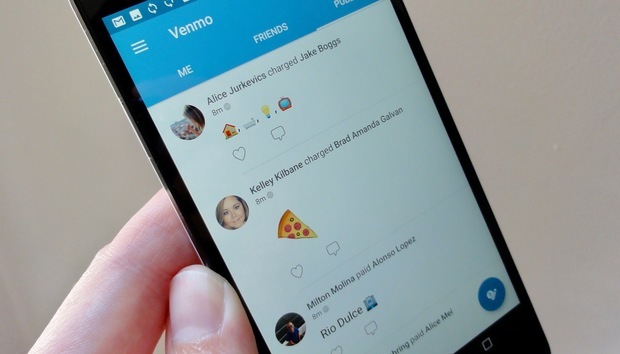 The Venmo mobile payment app boasts a huge user base, a sleek interface, flexible payment options and agility at splitting bills. Owned by PayPal) it's the peer-to-peer payment app to beat, as long as you don't mind getting social about the tabs you're picking up. Our only gripes are that it won't let you send or receive payments as a guest, and we wish it would let you adjust individual amounts when splitting a check. Watch out for transaction fees. Sending money with peer-to-peer payment apps can cost you depending on your method of payment. Across the board, you can expect to pay a small percentage fee for credit cards—generally three percent or so. Debit card transactions are usually free, but not always (we're looking at you, PayPal), while sending cash from a bank account is a free service for all the apps in our roundup. Be ready for spending and withdrawal limits. Generally speaking, you'll hit a soft cap after spending a certain amount of money (say, a few hundred) in a set amount of time (like a week). After that, you'll need to divulge more personal information (such as your full name, your birthday, your ZIP code, and a few digits of your social security number) to send more. Some of the services in our roundup spell out their spending and withdrawal limits in detail; others won't say until you hit the cap, and the cap may differ from one user to another. Only send cash to people you know. Most of the apps in this roundup emphasize that they're intended only for exchanging money between friends, family, or someone you know. Unlike payment apps geared toward online commerce, which often boast buyer and seller protections (such as the option to demand a refund during a brief grace period), peer-to-peer payment transactions are instant and final. Once the recipient claims the cash you sent, the money is gone, and there's no "Request a refund" button. Beware of scams. For example, look out for strangers who send you "accidental" P2P payments and ask for a refund, or anyone who tries to buy something from you (on, say, Craigslist) using a money-sending app. In both cases, crooks with bogus accounts could take your cash and disappear, and your promised money would evaporate along with them. Your best defense: Exchange cash only with people you know. Also, consider using a credit card for payment; yes, you'll owe transaction fees, but you'll also be able to dispute fraudulent charges with your credit card company. It could take a few days to get your money. While most of the apps in our roundup promise immediate cash transfers, the reality is that money you receive will typically appear as “pending” in your bank account for anywhere from 1-3 days. Some peer-to-peer apps are starting to offer "instant" cash deposits that are, in fact, instant (or at least, within a few minutes), but you may have to pay a small fee—either flat or a percentage—to put money transfers into your checking account right away.